Manny Kladatis - Call on Dolly! To read Broadway producer Manny Kladitis’ resume is like reading a history of Broadway of the latter part of the twentieth century and beyond. 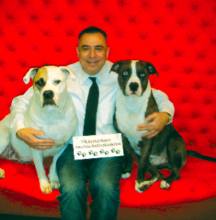 Manny Kladitis is the Founder and President of Niko Companies LTD., a group of theatrical Production and Management companies. This Show Biz powerhouse has a long list of successful productions under his belt including Frankie Valli and the Four Seasons on Broadway, Mike Tyson: Undisputed Truth, The Lyons, and Kathy Griffin Wants a Tony. That doesn’t even scratch the surface! He has also produced shows as varied as Man of La Mancha, starring the late Raul Julia and Sheena Easton, and Charles Busch’s off-Broadway hit Red Scare on Sunset. In 1996, Playbill.com interviewed Manny. 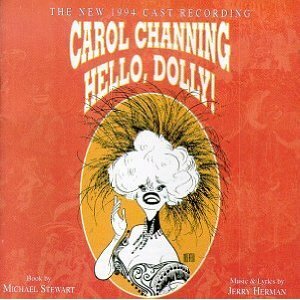 This was right after he had brought Carol Channing back to Broadway in a gorgeous revival of Hello, Dolly directed by Lee Roy Reams. The lyric, however, also serves as a motto of sorts for one of the busiest and shrewdest producers on Broadway and on the road. “You can’t do a show for just the love of it; you have to know what the audience is going to want and let that guide you,” says Manny Kladitis, whose Niko Associates is currently responsible for either general managing or producing seven major productions, including the successful road company of Ain’t Misbehavin’ and the recent Tony-nominated revival of Hello, Dolly! Google him! There is so much more. It is so extensive that if I were to start listing his productions, I would need a volume two. Manny was still in high school in the sixties when Dolly first hit Broadway and therefore did not see the original production. He did fall in love with the show thanks to the original cast album. 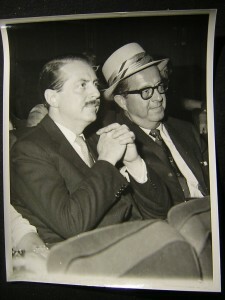 He also saw Ann Miller play Dolly with the Kenley Players in 1971. He thought she was wonderful. He dreamed that one day he would produce it and he did. Kladitis was only 19 at the time and an aspiring actor in summer stock in Ohio. In 1994, at 45 he was reputedly the youngest producer on Broadway. “At least Carol tells me that I am,” he said at the time. He was the driving force behind bringing the show back to Broadway thirty years later. 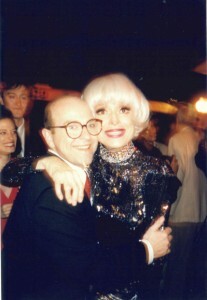 He is friends with Jerry Herman and asked to produce it. They managed to get Carol Channing through her agency. 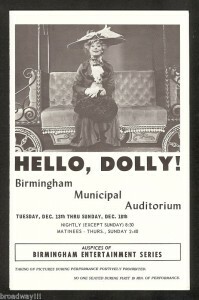 It was in 1964 that Channing first batted her velvet eyes and locked up the role of the musical’s matchmaker, Dolly Gallagher Levi. It all happened on Jan. 16,1964 when Channing opened in the role at the St. James Theatre in New York and the show kept on a roll for 2,844 in its original run. In 1994, she was once again casting her spell over audiences from coast to coast. They were off and running. They would end up doing a record breaking twenty six city tour before bringing it to Broadway for 118 performances. At the time, Manny said `There will be a Dolly around 25 years from now. Carol and I might not be with it, but there will be one.” And here I am celebrating Manny, Dolly, and this show’s great legacy. It was the quintessential production. Carol was sensational. Everyone did their best and it showed. Manny feels that it was even better than the original if he can be so brazen. The original didn’t have the gorgeous scenery that this production had. There was also better technology thirty years later. The costumes were also lush and beautiful. The staircase, itself, the handrails in the original were two by fours. For the 1994 tour and revival, they were genuinely carved handrails. Looking back, if he was given the opportunity once again, Manny would do everything exactly as he did it before. He is very pleased with that production. It was a terrific cast. Everyone was handpicked from Florence Lacy as Irene Molloy to Jay Garner as Vandergelder and beyond. Everyone was exquisite in their parts. Manny was involved in that selection process. The one comment heard over and over is that this was a family. They were very close-knit. 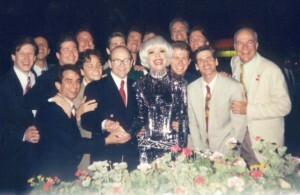 Manny adores Carol Channing. He learned an amazing work ethic from her. She is an amazing woman who loves what she is doing every minute. She puts her “all” into it both on and off stage. She is completely dedicated to what she is working on. He had to convince her to revisit Dolly. She wanted to do it but wasn’t one hundred percent sure. It would be at least a one to two year commitment. There have many comments from various company members at the disappointment that this production didn’t last longer on Broadway. There were many variables here, including Carol’s age. New York was also hit with a major blizzard in January ’96 which obviously cut into the box office. Carol DID put ALL her energy into making the show a success doing eight shows a week and NOT missing one. The balance of the time commitment was spent on the road in what now turned into a bus and truck company. Carol loved being on the road. She liked taking her performances “out to the people”. At the end of this, she did need a break. That devotion and dedication that was so ingrained in Carol is something that Manny carries with himself to this day. He likes to believe that he does that with all his shows. Certainly, he focuses on that. That was a great thing to walk away with. 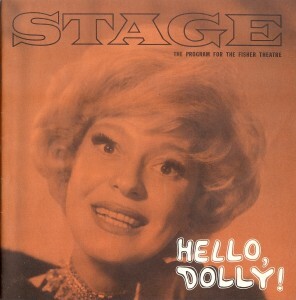 She was the ultimate stage actress. Manny has also worked with Yul Brynner, The Pointer Sisters, and George C. Scott. Carol had such an instinct and wisdom for the stage that she got everything across the footlights very clearly and precisely entertainingly and beautifully done. Manny knew from the first rehearsals with the cast that this was going to be a great production. Whether or not audiences would flock to see the show, they would find out. 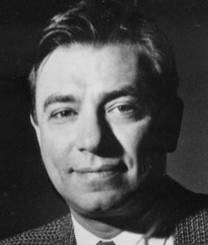 Jonathan Bixby designed the costumes building upon Freddy Wittop’s original designs. Manny had not worked with him previously as a designer, but rather, as an assistant to another designer that Manny had worked with. Unfortunately, Jonathan is no longer with us. He was terrifically organized. He was fastidious and careful about each of the designs and worked along with Jerry Herman, Manny, and Lee Roy Reams to develop the most beautiful clothes. Manny adores Jerry Herman. He is delightful, talented, brilliant, and has exquisite taste about everything, musically and visually. He is a dear friend and good hearted. He is specific, professional, disciplined. He could keep going. Lee Roy Reams who directed this production is a good friend of Manny’s as well. He is the consummate gentleman and a terrific director. He suddenly was in that case. He KNOWS that show. Manny’s worst experience with this production was the night that Mr. Merrick told him to go F! @# himself! At this point, Mr. Merrick was wheelchair bound. He had had a series of strokes. He saw the production in Providence prior to Broadway. He called Manny after a Saturday matinee from backstage at the theater after seeing the show. 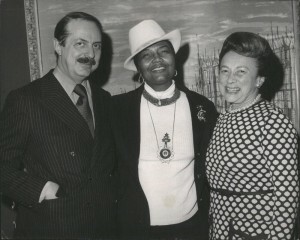 He was with Carol Channing and Charles Lowe. Mr. Merrick’s wife, Natalie, was doing the translating for him. He was unable to speak. She had conveyed that he thought it was the most beautiful production that he had ever seen and that he wished to be a part of it as it made its way to Broadway. Manny told him he would be thrilled to have him as part of his production. There would be nothing more flattering than to have the original producer on board, furthermore David Merrick desiring to join in on this production. What Manny didn’t realize in the course of that conversation was that Mr. Merrick literally wanted to take over and have Manny and Niko Associates step aside for no money. Manny told Mr. Merrick to go F! @# himself! It was a little scary to tell the “abominable showman” that…but Manny Kladitis did! They weren’t just going to turn this over to him for no money. Manny can understand why Mr. Merrick would want his name above the title alone with no one else’s. That is the way he had done every show he produced. Manny and Niko Associates were willing to take their names off of the production, but they were not willing to do so without some sort of remuneration. It was their production. Hello, Dolly is pure unadulterated entertainment. That is why audiences STILL gravitate towards Dolly. It is good enough for the whole family and great fun. One thing that always works is the title song. Manny attributes this to the grandness of the number. It is amazing, the choreography, the waiters with flying trays and giant leaps. Everything in that number is the epitome of what theater is all about. It communicates through dance, music. Manny thinks Bernadette Peters would make a great Dolly. Bette Midler would be a sensational Dolly. 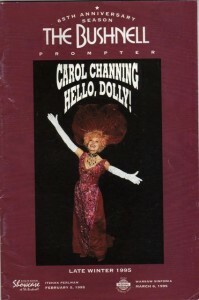 Carol Channing came down those famed stairs for the last time on January 28, 1996. It was a bittersweet moment for Manny. 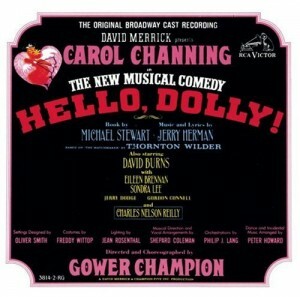 It would be the last time that he would be presenting Hello, Dolly!He desired to move on himself and he did. It was like losing a family member. They had had a wonderful time and, unfortunately, it was ending. He has been away from it long enough now that he would entertain the thought of looking at it again freshly. 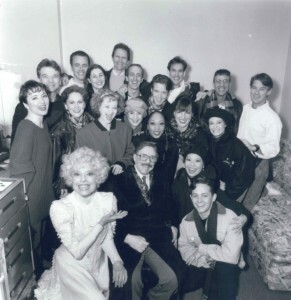 Hello, Dolly for Manny Kladitis was an incredible family affair with his theater family. Everyone worked so hard and well together. It was never displeasure to walk into the Lunt-Fontaine Theater. It was certainly several years out of his life. It significantly helped his career as well as his private life. It was so much a part of his life the four or five years total devoted to this project. He worked on it long before anyone else got involved.